This study, conducted by the Laboratoire de géologie de Lyon: Terre, planètes et environnement (CNRS/ENS de Lyon/Claude Bernard Lyon 1 University), in partnership with the Centre for Research on Palaeobiodiversity and Palaeoenvironments (CNRS/French National Museum of Natural History/Sorbonne University), is published on April 11, 2018 in the Proceedings of the Royal Society of London B. 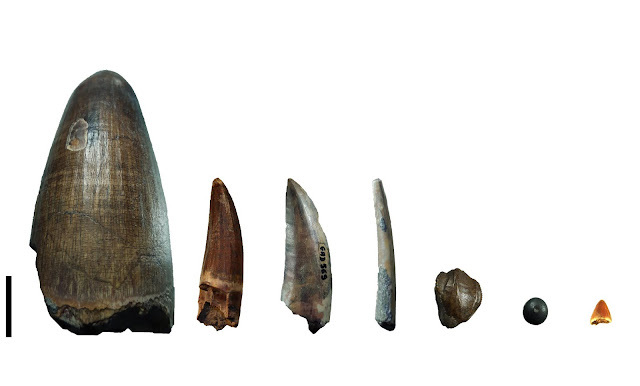 Teeth from the Gadoufaoua deposit (Niger). The scale bar represents 2 cm.From left to right: teeth of a giant crocodile, Sarcosuchus imperator, a spinosaurid, a non-spinosaurid theropod (abelisaurid or carcharodontosaurid), a pterosaur, a hadrosaurid (a herbivorous dinosaur), a pycnodont (fish), and a small crocodylomorph. A chemical element can have different forms, called isotopes, which are differentiated by their mass. A result that supports the finding of a previous study carried out by this laboratory, suggesting that spinosaurids had a semi-aquatic way of life.